Room 5's Alive (Take Two! ): New Zealand ShakeOut! 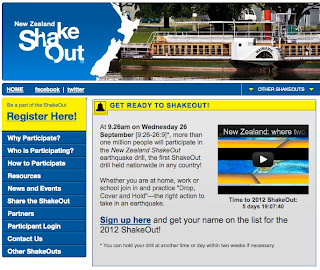 Next Wednesday at 9.26am we will be participating in the New Zealand Shake Out nationwide earthquake drill. In class this week we practiced our DROP-COVER-HOLD procedure. Of course, in a real earthquake it can be any time of day or night, and there is no guessing where you could be. Click on the image below to go to the New Zealand Shake Out website and discuss with your families what your plans would be if you were at home, or out somewhere in the weekend.